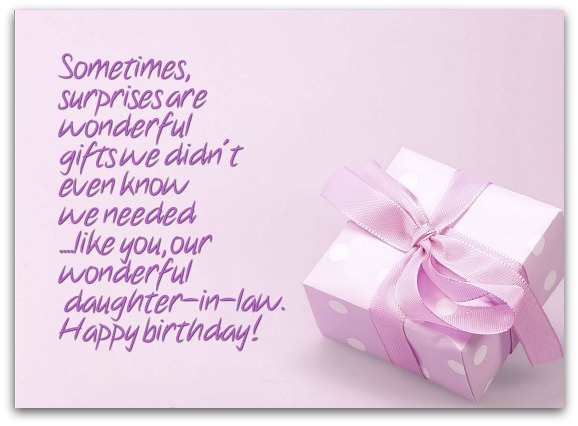 Here, choose from in-law birthday wishes with perfect birthday messages for all your in-laws. That's because the birthday greetings on this page, like your in-laws themselves, come in many shapes and sizes. 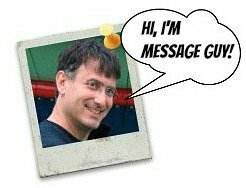 To get a head start on your daughter-in-law birthday messages, son-in-law birthday greetings and the rest of your in-law birthday verses, check out Message Guy Tip #79, which includes helpful hints for choosing in-law birthday messages. When our son announced your engagement, we were glad for two reasons: he was getting married and he was getting married to you. We think you're amazing. Hoping your birthday is as amazing as you are. Happy birthday to our sweetie of a daughter-in-law! You're such a sweetheart. I think we won the daughter-in-law lottery. Have a super-sweet birthday! We thank our lucky stars that our son proposed to you...and you said "yes" to him! Everything about you makes us happier than we have a right to be. Hoping your birthday is happier than you ever imagined. When you joined our family, we did not grow by one person — we grew tenfold. That's how awesome you are to us. Hoping we can make your birthday just as awesome! We're new to this daughter-in-law business, so we don't know the ins and outs yet. Are daughters-in-law supposed to be as wonderful as you? You're so wonderful. Happy birthday! Daughters-in-law are usually that other word for witchy, but you're not. You're great. We love you. Happy birthday! Dear son-in-law, your birthday is the best day of the year to pay tribute to the limitless amount of joy you've brought to our lives. Our wish for you is that you'll find the joy you so richly deserve. Calling you "son-in-law" doesn't do justice to the wonderful, rewarding relationship we have with you. I think we're going to start calling you "son" from now on. Happy birthday, son! You are the kind of person anyone would fantasize as the ideal son-in-law. We are glad to have you for real. Happy birthday, son-in-law! Happy birthday to our amazing son-in-law. After our daughter, you're our favorite. Some days, we even like you more than her! Just thinking about how wonderful you are and think it's time we let you know how we felt! Happy birthday to our most wonderful son-in-law! We love calling you our son, so we will remove the words "in-law" from your official title. Happy birthday, sonny! You are a very special person. We are glad to have you as family! 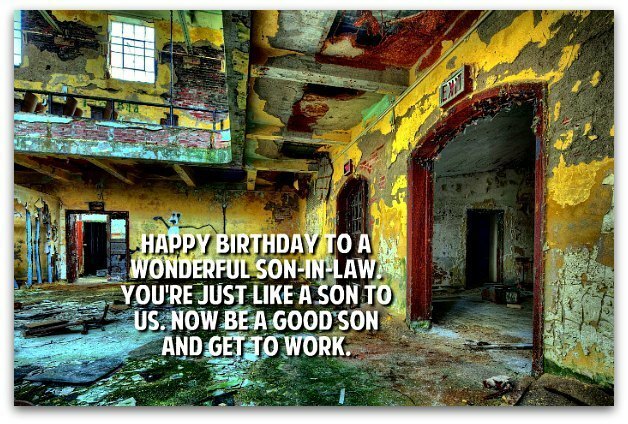 Happy birthday, son-in-law! Happy birthday to a wonderful son-in-law. You're just like a son to us. Now go grab a hammer and let's get to work before the next millennium. Under the law, you're our son-in-law. In our hearts, though, you're our son. Happy birthday to one of the best men we know. Happy birthday to our son-in-law, the latest — and greatest — addition to our family! Hoping your birthday presents are as awesome as your presence in our lives! Everything about you is great. You have a great wife, a great heart, a great face, a great mind and, greatest of all, us. Happy birthday to the greatest son-in-law ever. We always wanted a son. Now we have one...with a wonderful son-in-law like you. Happy birthday, son! Happy birthday, dear son-in-law! It's easy to see why our daughter chose you to be her husband. You're charming, handsome, established, smart and, most importantly, obedient! Happy birthday to the funniest son-in-law ever! You make us laugh so hard. That's a great gift for you and the best medicine for us. A warm and wonderful birthday is what we wish you, dear son-in-law. May your special day be as special as you are to us!